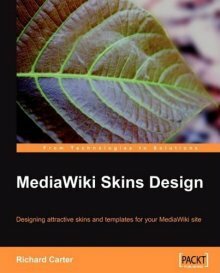 My MediaWiki Skins Design book is designed to guide the reader through skinning MediaWiki, the software behind Wikipedia and many other wikis. The book guides the reader through planning their design, based on the target audience and the purpose of the wiki to thinking about things like search engine optimisation, moving on to integrating social networking and media tools such as Twitter. As a seasoned MediaWiki consultant, Richard Carter imparts his knowledge and experience in to the book. Whilst I invite feedback on the book, there is an errata section on the publisher’s website. Richard Carter is a founder of Peacock Carter, and acted as a technical reviewer on the MediaWiki 1.1 Beginner’s Guide book. Peacock Carter offers MediaWiki development and consultancy to businesses across the world. You might also find my MediaWiki HTML5 skin of interest.